1 April 2011: What is a city? Defining New York, Chicago or Los Angeles is easier said than done. Where the border between a dense urban industrial, cultural and political center and the outside world was clear a century ago this is no longer the case. Take any major American metro area today and there will be both a central city  the political entity of New York, Chicago or Los Angeles that once was the metropolis  but also an urban landscape of millions of people that begins wherever the city limit ends. Once there, on the outside, you will be inside an older suburb that looks very much like a city and beyond that endless rows of single family homes, condominiums, supermarkets, malls, office parks, industries and parking lots where people live, work and shop. The modern American metropolis is an integrated urban region that consists of a multitude of local governments that share a common market and depend on each other for the free flow of goods, people and ideas. While it simultaneously is divided into hundreds of political jurisdictions that are both competing with each other for residents and investments, as well as being forced to cooperate in order to guarantee the continued economic success of a region whose competitiveness they all depend on. The clustering of human beings in cities creates many new problems that demand solutions beyond the scope of the individuals. Every locality needs large-scale and long-term investments in roads, highways, public transport, sewage systems, airports, harbors, schools, universities and cultural institutions that depend on the involvement of many local governments to prosper. How then, is the economic growth of a metropolitan area affected by a fragmented regional governance structure? Can any of the difference between a slow-growing metropolitan area like Pittsburgh, PA  with its six counties and 412 municipalities  and rapidly expanding Phoenix, AZ  with its two counties and 32 municipalities  be explained by how the two areas are governed? Proponents of regionalism have long argued that extensive government fragmentation will impede regional economic development since it obstructs the realization of economics of scale in service delivery as well as limits or sometimes even prevents “adequate investments” in regional infrastructure from taking place. As the American economist Charles Tiebout pointed out in the early 1960s, when many smaller jurisdictions act independently of each other there was not only the possibility that potential economics of scale and scope remained unrealized, but that some forms of services and investments that might benefit the metropolitan area as a whole might never be undertaken at all. Tiebout argued that this problem could emerge at any time when the service that one community produces is affected by actions in neighboring jurisdictions. One example of this is ‘metropolitan transportation’. If each individual locality produces the service within its own limits transportation has been provided, but it’s not certain that the service “metropolitan transportation”  networks of roads and public transportation that enables residents to easily traverse a metropolitan area  has been adequately supplied since that would demand region wide coordination. 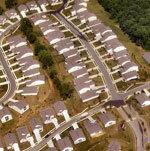 High levels of fragmentation within a metro area may therefore lead to a lack of investments. This is also supported by what little empirical evidence there is. Despite a rich theoretical literature about the affects of government fragmentation on infrastructure investments, there has up to this date been little research that sets out to measure this effect. But in an attempt to do this (by looking at the aggregated county expenditure on highways and sewage systems within all US metros) I found that a higher number of counties in a metropolitan area does indeed have a negative effect on infrastructure expenditure, indicating that regionalist have been right  increased government fragmentation leads to less infrastructure investments on a metropolitan level. Because of this, a regional governance structure (which doesn’t have to take the form of one single general-purpose government but could consist of several special-purpose districts such as a public transit authority with regional powers) within a metropolitan area would lead to a more efficient administration and public service provision. This means that even though a successful Pennsylvania suburb may feel completely independent from the blight of downtown Philadelphia, cities and suburbs are in fact interdependent. Suburbs benefit when their core cities are viable  that is, densely populated and prosperous  since they are part of the same economic region and rely on up-to-date infrastructure. In Ties that Bind  Central Cities, Suburbs, and the New Metropolitan Region, H.V. Savitch, at the University of Louisville, presented findings that a large share of suburban incomes in major U.S. metropolitan areas is generated in the core cities and that suburban economic developments follow those in the central city. Another economist, Richard Voith of the Federal Reserve Bank in Philadelphia, came to similar conclusions in his City and Suburban Growth: Substitutes or Compliments after investigating whether a metropolitan area’s central city and its surrounding suburbs are substitutes or compliments, and found strong results for the fact that they are compliments. According to Voith, the decline of central cities affects the entire metropolitan region negatively in three ways: through amenities, agglomeration economies (benefits that firms get from locating near each other) and social problems. When a central city is declining  i.e. experiencing negative population growth and a deteriorating tax base due to a flight for the suburbs  the amenities that it can offer its residents diminish as well. But this is not only a problem for the city in question since some of these amenities (cultural institutions, vibrant pedestrian districts, waterfront parks, libraries etc.) while tied to a single locality are valued by an entire region. When a continuous outflow of residents from the urban core hinders the declining community to provide basic public services and regional amenities such as these; it ends up making the entire metro area less desirable. Part of the allure of a New York suburb is that it is right outside of New York, while a precious few, if any, move to the Detroit metro area because of what Motown can offer. Metropolitan areas are also affected by a decline in agglomeration economies. Compact development of cities supported by high density public transportation increases the opportunities for agglomeration economies to form. When central cities experience urban decline, agglomeration economies follow suit. Individual firms that benefit from these may then pick up their operations and relocate to another area that offers stronger network effects. Finally, Voith also discusses the social spillovers that declining central cities generate. With increased out-migration and urban decline, the central city is left with high populations of low-income, low-educated residents, a steadily declining tax-base and strained public services that discourage new firms and citizens from settling down. In the long term, the fragmented metropolitan area gets divided into an ever-growing number of planning and zoning authorities that make regional coordination difficult, while the central city finds itself in a negative spiral of urban decline where it continues to lose residents, jobs and tax-revenues to the suburbs. And in so doing, puts a negative pressure on the metro area as a whole when inner city decay slowly spreads outwards and starts affecting the surrounding municipalities through various spillover effects and, in the long run, leads to the outmigration of suburban residents to more successful metro areas. An analysis of income and population growth in all US metropolitan areas for the period 1980-2000, based on 2000 US Census data (this was right before the 2010 Census data started trickling in), supports this picture as well. A higher level of municipal fragmentation is negatively associated with population growth in all American metropolitan areas  large ones as well as small ones  while it also has a negative impact on income growth in larger metro areas of more than 300,000 residents. 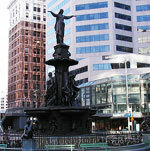 It is therefore clear that the fragmented governance that can be seen in many large American metro areas such as Greater New York, Chicago, Philadelphia, Pittsburgh or Cleveland  where each metropolitan region consists of hundreds of local governments  leads to slower growth, not only for the decaying central cities but for the region as a whole. Whether this is due to inadequate metropolitan investments, deteriorating amenities, disintegrating agglomeration economies or social problems in the central city that are spreading outwards, it is worsened by a lack of regional coordination that is holding America’s metropolitan areas back. *This article is based on Markus Berensson’s BA thesis in economics: Metropolitan Fragmentation and Economic Growth. Markus was awarded a BA from Uppsala University, Sweden, in January 2011. The full thesis is available free of charge on request. Please email info@citymayors.com and insert ‘Government fragmentation’ in the subject line. Please also provide your name and details of any organization you may belong to.